A view of the instrumentation inside the A-29 recording high altitude flight data. 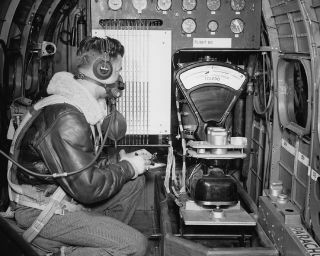 In this historical photo from the U.S. space agency, a view from May, 1944, while recording high altitude flight data in a flying laboratory at the Aircraft Engine Research Laboratory of the National Advisory Committee for Aeronautics, Cleveland, Ohio, now known as the John H. Glenn Research Center at Lewis Field. The aircraft is a modified B-29 bomber manufactured by Boeing, and backbone of the World War II effort. It was used to determine what conditions cause ice to form on wings and aircraft surfaces. The National Advisory Committe on Aeronautics (NACA) was a precursor to NASA. NACA was created by Congress in 1915.